Benjamin Baker KCB KCMG DSc LLD MAI FRS is the man behind some of the world's most influental structures. Born at the height of Britain's Industrial Revolution and trained at the innovative Neath Abbey Ironworks in Wales, he went on to excel in many fields of engineering. A brilliant conceptual engineer, he also had the tenacity to see his projects through with an extraordinary attention to detail that has ensured their longevity. In his early career he joined the company set up by distinguished civil engineer Sir John Fowler, establishing a long and productive partnership and enduring friendship. 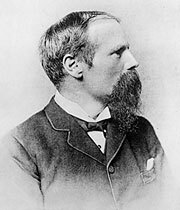 Baker's work, including his work with Fowler, became known throughout the world and his research influenced engineers from Canada to Japan. In the design of the iconic Forth Rail Bridge (1882-1890), designed in association with Fowler, he strove for a pure engineering form, creating a new aesthetic in the process. Among his many outstanding achievements are his major contributions to the engineering design of the London Underground, New York's Hudson River Tunnel and the Aswan Dam in Egypt. Baker was an excellent public speaker, giving illuminating talks both to lay people at The Royal Institution (including his highly original human cantilever demonstration) and to fellow professionals round the globe. He published influential technical papers and was widely recognised as the man to consult if you had a difficult or unusual project. He was celebrated in his time, and has arguably only fallen out of public consciousness through want of an iconic photographic portrait and the general shift away from public profile for individual engineers in the 20th century. 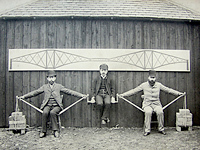 Baker's famous practical demonstration of the cantilever principle used in the design of the Forth Rail Bridge. See separate article: The Forth Rail Bridge > for more on the cantilever principle.